Southborough MA - [April 1, 2016] In response to advertisers’ challenge to cut through the noise of an always-engaged but always-distracted growing mobile population, Cidewalk.com the mobile division of Chitika, Inc today unveiled Chatting Ads that let consumers have two-way conversations with advertisers in real time. 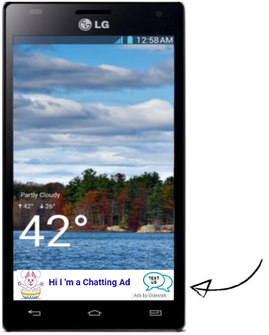 Chatting Ads are texting-enabled mobile ads that let consumers click and send a text message directly to the advertiser, creating a more engaging experience that meets both the needs of the brand and the consumer. In this age of 8 second attention span, text is the new email. The explosive growth of mobile usage, is resulting in ad dollars chasing mobile users. The billion-dollar question in this fast growing mobile eco-system – how can advertisers create a more engaging experience that compels the consumer to act? Nothing is more engaging or natural than mobile chat. With high open/engagement rates, text messaging is the most effective untapped direct marketing channel for advertisers to reach and engage with their customers. It is interactive, immediate, personal, and track able. "For advertisers, Chatting Ads offer a very powerful channel to engage with and nurture new customers to their business" said Venkat Kolluri, CEO of Cidewalk. Start the Conversation with Your Customers: Chatting Ads transform traditional mobile advertising into an engaging and entertaining conversational experience, finally giving consumers and advertisers the opportunity to interact directly and have a say in how they want to nurture their relationship - by chatting. "I have always believed in experience optimization. This is about dynamic personalization and allowing potential customers to engage with their brands of choice when they want to. It's about customer led relationships and this allows the customer to take control. This also fits well with the growth and adoption of messaging apps allowing direct and immediate engagement. " said Rob Griffin, Chief Innovation Officer at Almighty, a Boston-based digital agency. Using Cidewalk's self service system, getting started is easy. Just create a two line text ad, a logo or image (optional) and enter the mobile phone number to receive text messages from interested consumers. Ads will instantly be launched on thousands of mobile phone apps geo-targeting users in the selected town. The service is based on a monthly subscription model. Cidewalk has partnered with many of the leading mobile ad exchanges such as Google AdX, AOL/Millenial Media, and Opera to name a few, to ensure broad reach and distribution to more than 100,000 app publishers and millions of consumers nationwide. About Cidewalk: Headquartered in Southborough, MA, Cidewalk.com, the mobile division of Chitika, Inc., connects advertisers with local consumers and grows their new customer leads lists through the power of mobile marketing.